When we look up to the night sky for some stargazing, we’re lucky enough to spot a single band of the Milky Way Galaxy that we call home. However, out in the unending vastness of the known universe, countless celestial bodies dwarf our planet and everything on it. Few things are as inconceivably large as entire galaxies: They’re so incredibly vast that they’re measured by how many light years across they are. Therefore, we’ll be arranging this list of the 10 largest galaxies in the known universe according to their diameter in light years. Let’s take a look at some of these impressively large celestial entities and learn a little bit about each one. The well-known Andromeda Galaxy, also known as Messier 31, is a spiral galaxy and the nearest neighboring galaxy to the Milky Way. In 4.5 billion years, scientists believe that the Andromeda Galaxy and Milky Way Galaxy will collide, crashing together to form a new, giant elliptical galaxy. 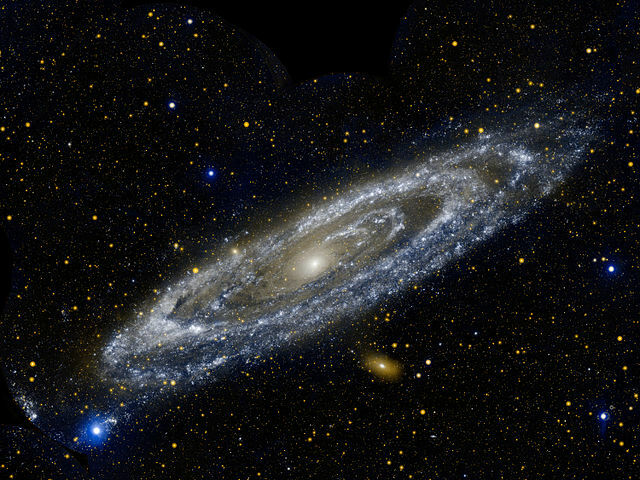 Although the Andromeda Galaxy contains around a trillion stars, it’s actually smaller than the Milky Way as result of containing less dark matter. The Andromeda Galaxy is the most distant thing in space that you can see with your bare eyes alone. Classified as a disrupted barred spiral galaxy, the Tadpole Galaxy stands apart from most of its counterparts. The unique tadpole-like shape that earned the galaxy its name is what makes it so unusual. 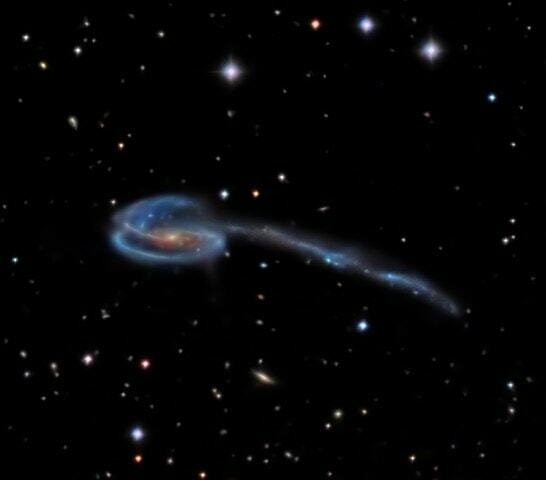 Scientists believe that the Tadpole Galaxy got its unique shape from a prior collision with a smaller galaxy. The materials of the weaker galaxy have been absorbing into the Tadpole Galaxy, giving it the tail that makes it so notable. Just like its namesake, the Tadpole Galaxy is predicted to lose its tail as it grows older, as a result of the trail of galactic matter finally being absorbed into the main spiral. ESO 444-46 shines as the brightest member of the galaxy cluster Abell 3558 which lies in the Shapely Supercluster, setting it apart as particularly beautiful from a distance. 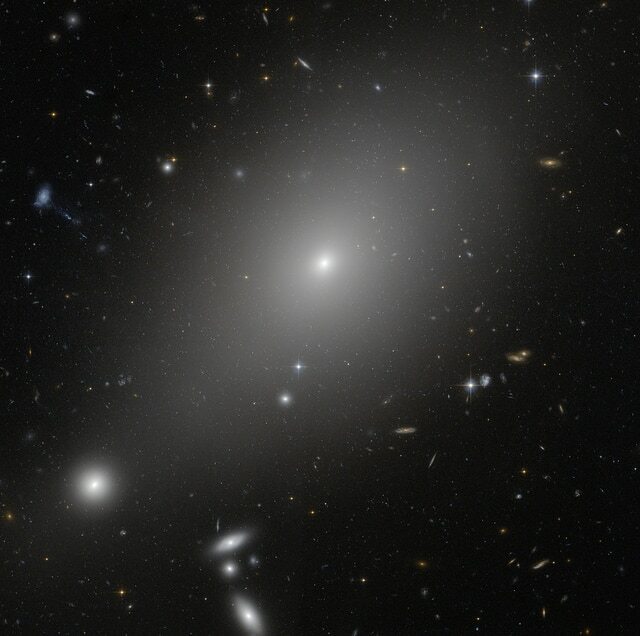 This elliptical galaxy also boasts an estimated population of about 27,000 globular clusters, which could establish it as possessing the largest population yet studied. ESO 444-46 is the largest known concentration of matter in the observable universe. It has approximately the same mass as 10,000 Milky Way Galaxies! This giant barred spiral galaxy, also known as the Condor Galaxy, is the largest known spiral galaxy in the observable universe. It owes much of its attributed size to the long, distinct arms that inspired its name. NGC 6872 is located in the southern constellation Pavo, “the Peacock”. The notable elongated shape of this beautiful galaxy is thought to be a result of its ongoing collision with the smaller galaxy IC 4970. 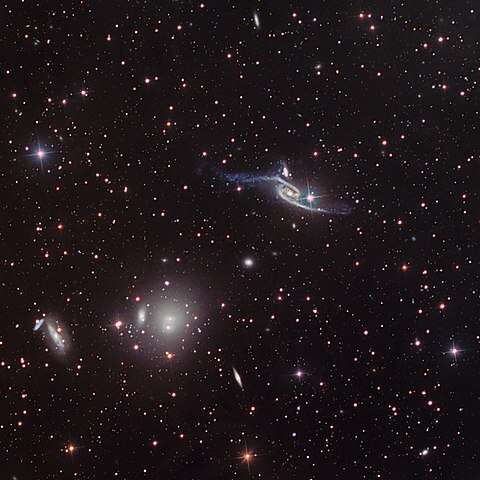 The long-standing collision between NGC 6872 and IC 4970 is considered to be the reason for the unusual kink in one of the Condor Galaxy’s arms. This impressive spiral galaxy stands apart from its neighbors as a result of its distinctive blue “knots” and wisps of young stars that trail in its wake and give the Comet Galaxy its name. These unusual features are thought to be caused by the gravitational pull of another galaxy cluster. Gravitational pull like this can starve a galaxy for the gas needed to create new stars and cause sever shrinking over time. The Comet Galaxy has provided scientists with valuable insight in terms of what causes strong, vibrant galaxies to become “gas poor” and dwindle into irregular or elliptical-shaped galaxies over time. While certainly impressive in size, the unbarred spiral galaxy UGC 2885 displays relatively low surface brightness. 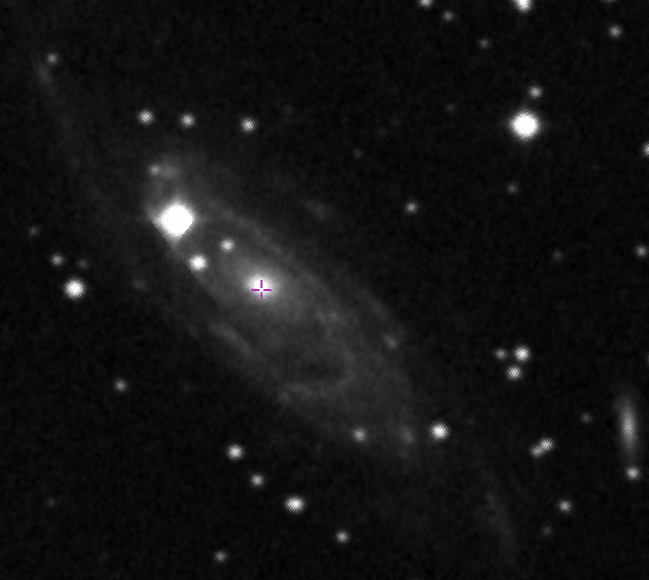 It’s so faint, in fact, that its arms can only be observed via long exposure in infrared wavelengths. 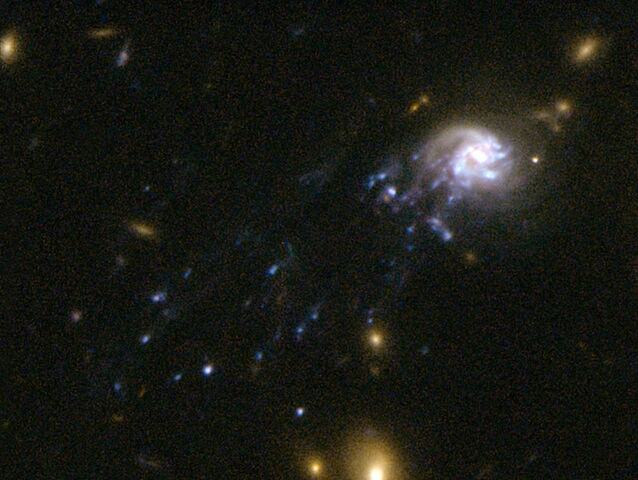 As a result, its center giant nucleus is this galaxy’s most outstanding feature. The origin of this galaxy raises a lot of questions, but the leading theory states that it was likely formed by gas rather than by the collisions of smaller galaxies. 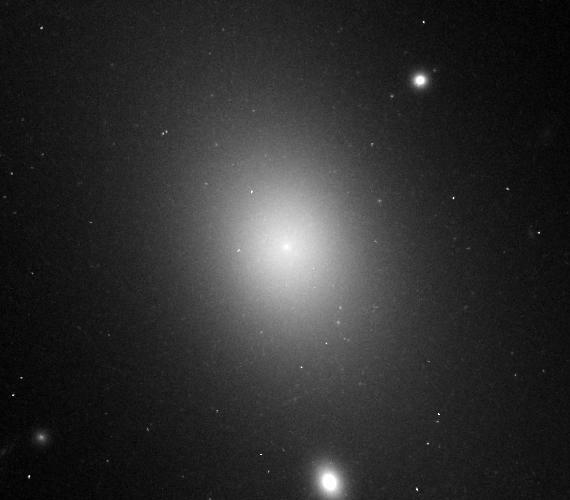 ESO 306-17 is classified as a fossil group giant elliptical galaxy, and sits in a noticeably empty section of space. Scientists believe that this conspicuously empty space surrounding the galaxy indicates that ESO 306-17 absorbed all of its neighboring galaxies years ago, thus earning it the classification of a fossil group. Due to its distance from the Milky Way Galaxy, we are observing ESO 306-17 as it looked during the time of the “Cambrian Explosion” in Earth’s history. 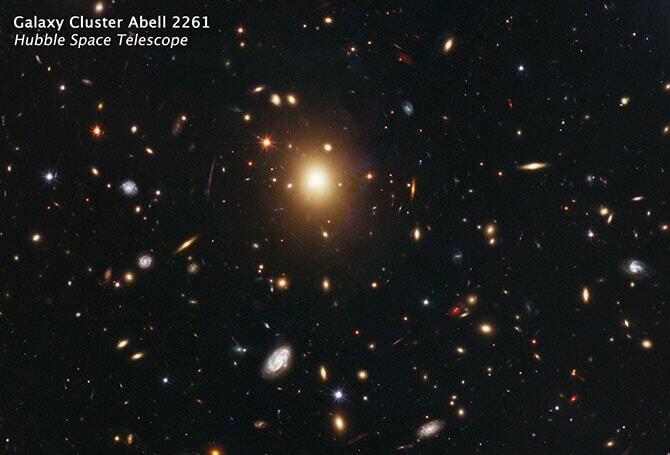 A2261-BCG is the largest and and brightest of all galaxies within the Abell 2261 galaxy cluster. In addition to its impressive size, this galaxy stands out as having the most massive galaxy core ever observed. 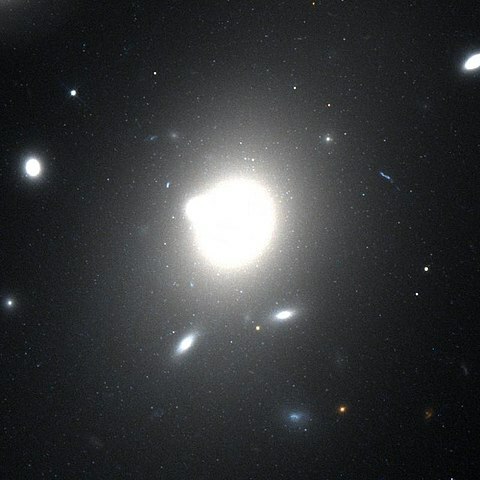 The core of A2261-BCG is also distinctly different in appearance from the center of most galaxies, lacking the characteristic bright ring surrounding a black hole. Scientists speculate that the size and appearance of this galaxy’s massive core might have been caused by the merging of two separate black holes. Known for being the brightest radio-emitting object in the constellation Hercules, 3C 348 (Hercules A) emits almost a billion times more power in radio wavelengths than our Sun! 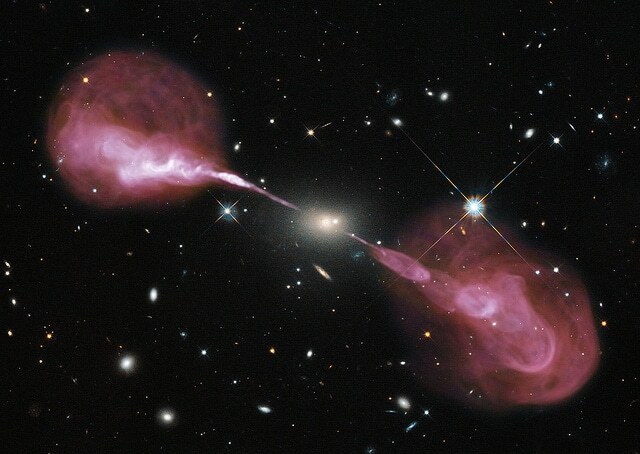 The formation of Hercules A is unique in shape, sporting two cosmic jets that extend from its center. These jets are invisible to the human eye and have been detected via radio signal. A smaller, elliptical galaxy has been spotted close to the center of Hercules A, and may be merging with the center galaxy. IC 1101 is the largest galaxy in the observable universe. This supergiant elliptical galaxy is estimated to be around 2000 times larger than our Milky Way Galaxy, and also sports the largest known supermassive black hole known to man. This awe-inspiring black hole is likely what generates the bright radio signal emitted from the galaxy’s center. This massive galaxy is populated by stars rich in metal, which give it a golden-yellow color.